Stahl's ear is a rare congenital deformity of the pinna with a third crus resulting in an 'elf-like', 'Vulcan-like' or 'satyr-like' appearance with pointing of the ears. Early recognition of the condition allows successful early conservative treatment and may avoid the need for surgical correction at a later stage. 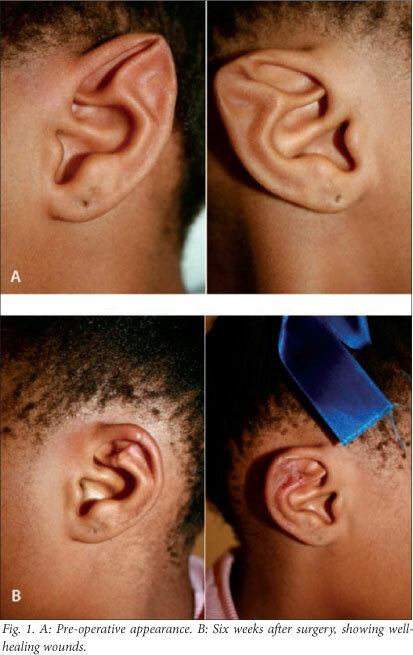 We present the case of a 7-year-old South African girl with bilateral Stahl's ears, who presented with psychological distress as a result of being ridiculed at her school. The deformity was surgically corrected with a good cosmetic result and patient satisfaction. Originally described by Stahl in the 19th century, the rare congenital deformity of the pinna that bears his name is more commonly known today as 'Spock ears' or 'Vulcan ears', after the well-known Vulcan, Mr Spock, from the popular science fiction series Star Trek. Other names include 'elf ears' or 'satyr ears, after the corresponding mythological creatures. Few epidemiological data are available in the Western world. This may be due to the rarity of the condition, the higher prevalence in oriental races, and the fact that it is often simply grouped with more common conditions in the literature. The causation of the condition is unknown. There is, however, a familial tendency, with 75% expression in identical twins. An abnormal course of the transverse auricular muscle was found by Yotsuyanagi et al., which was postulated to be of aetiological significance. Clinically the condition may be recognised by a third crus with a flattened antihelix and a malformed scapha, creating the characteristically shaped ear. Yamada and Fukada classified the condition into four types: postero-superior crus with a sharp helical ridge (type I) or a round ridge (type II), two ridges (type III), and the crus extending postero-inferiorly (type IV). A 7-year-old girl was brought by her mother to the plastic surgery outpatient clinic at Kimberley Hospital Complex in the Northern Cape Province of South Africa. She was allegedly being teased at school because of her 'funny ears', and had become progressively more withdrawn and depressed. There was no family history of any auricular deformities. On examination, no other abnormalities were detected apart from the bilateral type 1 Stahl's ears, with the third crus creating a sharp point on the helix giving the classic elf-like appearance. The technique used for correction of the deformity was a bilateral star-shaped excision as described by Maurice and Eisbach. After uneventful recovery, with follow-up after 2, 6 and 24 weeks, the child was very satisfied with the result achieved (Fig. 1). General practitioners, family physicians, obstetricians and paediatricians should be aware of this condition, because early referral can prevent the substantial psychological trauma these children are likely to experience later in life. Management of the condition depends on various factors, including the time of presentation, the type of deformity and the surgical expertise available. Early presentation and appropriate referral may allow non-surgical management with ear moulding by splinting the ear in the desired position. An insulated rigid wire is placed along the curve of the helix. The helix is then folded over the wire and held in place with an adhesive tape. Readily available materials such as a feeding tube or small suction catheter can be used to cover an ordinary steel wire. A large systematic review concluded that moulding is a simple and effective procedure, but that the optimal timing and duration of splinting has not been established. The average splinting time used in the reviewed studies was 2.1 months. One of the original authors concluded that Stahl's ears should only be splinted in the neonatal period, yet some other studies report success in older age groups. Should specialist treatment not be available, neonatal moulding may be undertaken by other disciplines or by the parents themselves. [5,6] Plastic surgeons should familiarise themselves with the different treatment options and be aware of the relative and full expression of this deformity, which may be confused with a simple case of 'floppy ears' and therefore be under-corrected. Stahl's ear is a rare congenital deformity in the Western world and therefore often not recognised and referred early. We aim to raise awareness of this condition, and emphasise that with early intervention non-surgical treatment should be successful. Failing that, early surgical repair can be undertaken before these children are exposed to an environment where they may be ridiculed and victimised.